Jack Tapper of ABC News, explaining the condition Medal of Honor recipient Clint Romesha has for granting an in-depth TV interview. Former Staff Sgt. 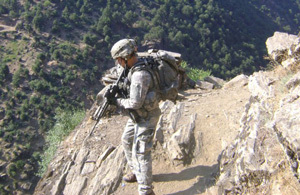 Clinton L. Romesha conducts overwatch in Afghanistan in 2009. Romesha’s unit, Bravo Troop, 3rd Squadron, 61st Cavalry Regiment, 4th Brigade Combat Team, 4th Infantry Division, was assigned to a small, primitive combat outpost. Former Army Staff Sgt. Clint Romesha is only the fourth living person to receive the Medal of Honor, (the nation’s highest military decoration) for courage in Iraq or Afghanistan. Staff Sgt. Clinton Romesha, 31, an Army sergeant who ignored his battle wounds to take out the enemy, rescue the injured and retrieve the dead during an ambush by 300 fighters in Afghanistan received the Medal of Honor on Monday, Feb. 11, 2013.